Cabinet doors are the make it or break it of kitchen design. Along with countertops and floors, they are the most used part of a kitchen and are the most visually noticed element of the room. Depending on what you put into your cabinetry, it can either simply do its job of holding dishes, or it can be a statement of what the kitchen says about you. As the kitchen is often the most common gathering room of the house, it’s important for the kitchen to both work as a functional kitchen, but also allow for entertaining casual guests. Your kitchen design is a statement about how you hold yourself and value your guests. 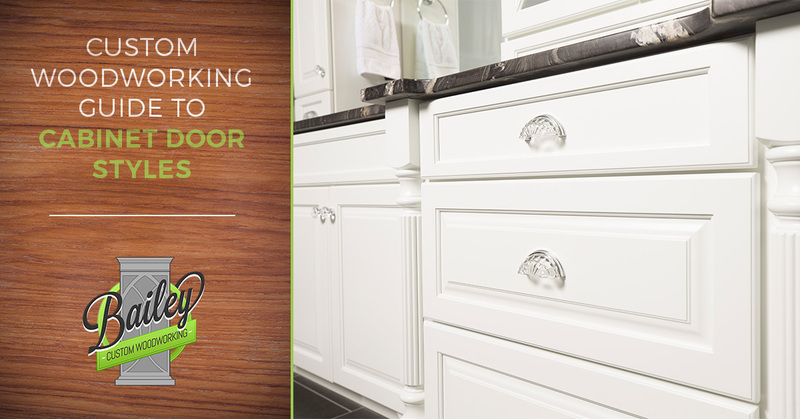 Today, Bailey Custom Woodworking will cover the basics of door designs and how they fit into kitchen design. Shaker style cabinet doors are the most common cabinet door style in modern kitchens. It emphasizes the simple, straight lines, and utility in almost any wood type, color, and decor style. This door style is named after the distinctive shaker furniture that mimics the same simple design. This simplicity allows the kitchen to not say anything in particular and doesn’t take any strong stance stylistically or architecturally. These doors are among the highest quality on the market, and are a classic look that can and does last for generations. If you are looking at your kitchen as a lifelong investment, or way to improve the resale value of your home, then inset cabinets are the way to go. The price tag comes from the custom engineering that takes into account seasonal expansion and contraction of the wood to make sure that it will always close and open properly within the precisely measured frames. One of the issues with mass produced cabinets of this type, is that the workmanship is rarely this precise, and never as customizable. Inset doors require exposed hinges that can add a bit of accenting and panache with the use of the right joints. Flat cabinet doors are exactly that—flat. They can come with hidden or exposed handles, and are used in modern and contemporary, minimalist-designed kitchens. Flat doors can come in almost any color, material, and pattern. These are used primarily for lighter colors and well-lit kitchens. The simplicity of this style also matches either solid colors or works well to offset the exposed wood textures of a rustic style kitchen. Distressed cabinets are very popular in rustic-designed and traditional kitchens. This antique look gives your kitchen cabinets the look of years of use to help accentuate the feeling of timeless beauty. Custom work on distressed cabinets includes rubbing corners off, and artificial distressing of the cabinets.Some distressed style cabinets are not created but found. Using repurposed wood allows cabinets to tell add the timeless style of a distressed look while each telling a story of their past. Beadboard was once used to decorate walls before plaster and paint became more popular. Now it is a popular addition to your kitchen cabinets. Beadboard is a common commercial, or custom cabinet style that evokes a European-cottage feel and pairs well with arches, high ceilings and bright colors. Beadboard is perfect for the kitchen that says “clean” while it invites you to tea and a good chat. This traditional panelling is a good option that falls in between fully ornamental and the simple and utilitarian. The beauty of custom-designed cabinet doors is that you can get almost any cabinet style in any kitchen architecture and you can even make your own style and requests for custom design. If you want a more industrial feel, you can use corrugated sheet metal, or if you are feeling traditional, our custom carpenters can inlay beautifully ornate designs or even stained glass reminiscent of the past nobility. Check out our gallery of beautiful wood work and custom cabinets. If you are in the the Springfield, IL area and are looking for unique and spectacularly done custom cabinets, we are your choice in building into any kitchen architecture, and matching our clients’ desires. From custom archways to custom cabinetry, we have exactly what you need. We know that your kitchen is an expression of yourself and your relationship with your guests. We want to make sure it says exactly what you want it to say. Contact Bailey Custom Woodworking for a quote or with any questions you might have regarding our custom work.